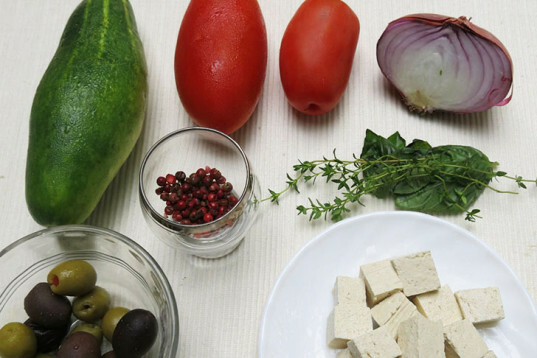 We all love Greek food so we scouted a delicious vegan alternative to the classic Greek Salad. 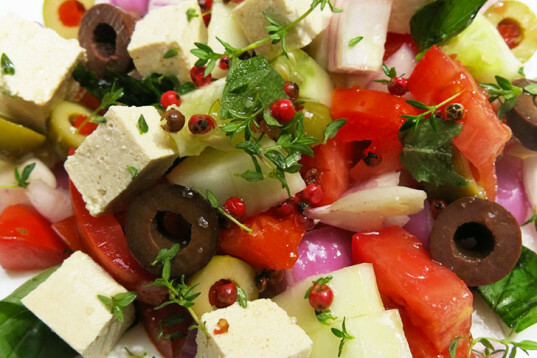 Also known as 'rustic salad' or 'summer salad,' this recipe is traditionally made with chunky tomato pieces, cucumber, red onion, feta cheese and black olives seasoned with marine salt, oregano and plenty of extra virgin olive oil. But we have changed the goat's milk cheese for soya-based organic tofu, which adds protein and makes it completely animal-free. The secret to this colorful Mediterranean salad, as always, is to use as many fresh, local, organic ingredients as you can find. Try giving your own twist to the recipe but make sure you keep the essentials. 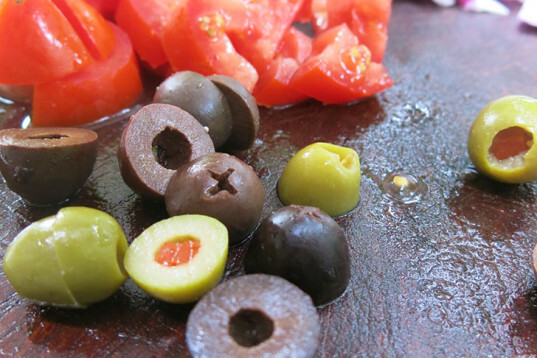 We've added some green -- as well as black -- olives, a few leaves of basil and sprinkled locally grown red pepper, which adds a soft fruity edge to this wonderful Greek mix. 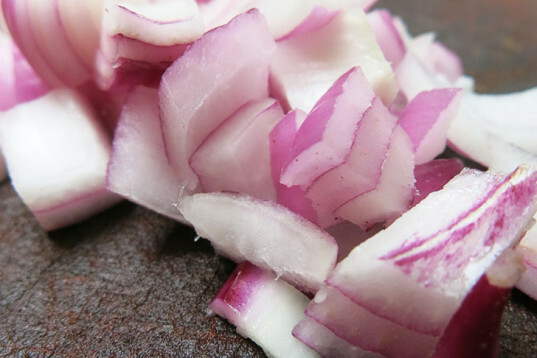 Wash the red onion under hot water, cut it in half, remove the skin, and chop the half into small pieces. 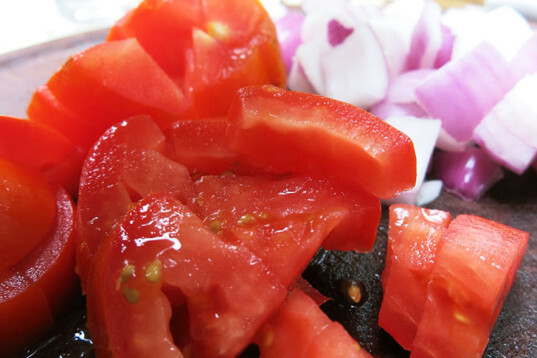 Continue with the tomatoes, peel them if not organic and chop them into bigger chunks. Add a pinch of salt so they start releasing their juices. Take the pits out if you need to, otherwise cut them in half, horizontally, so you get the cute star and red circle with a green edge into the mix. 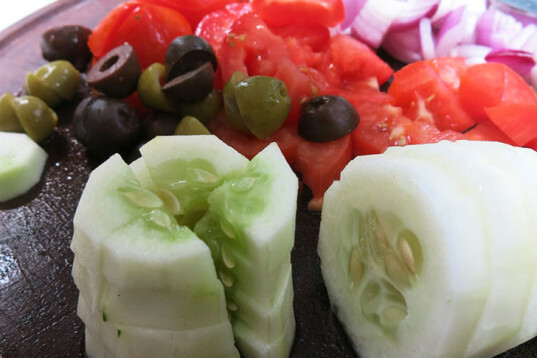 Peel and cut the cucumber into small chunks. 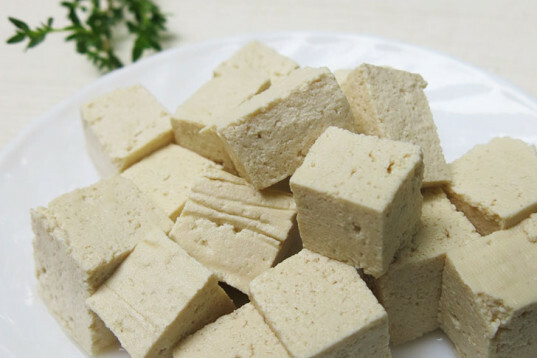 Wash and cut the organic tofu into cubes. 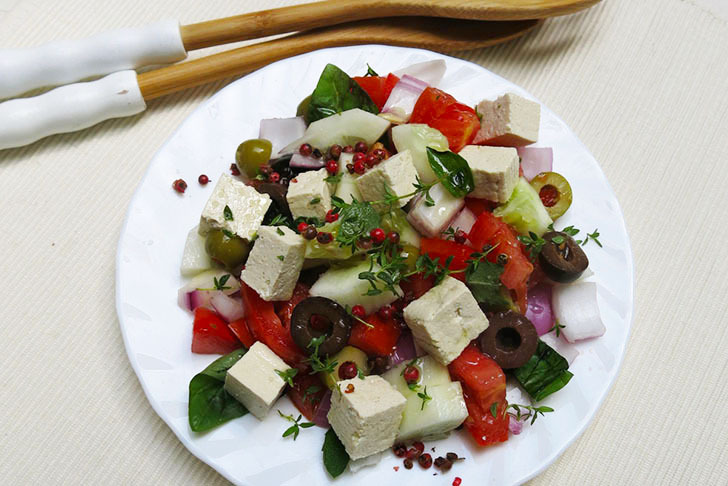 Toss the onion, tomatoes, olives, cucumber and tofu into a salad bowl, add fresh oregano and basil leaves, sprinkle with marine salt and red pepper and serve with a generous amount of extra virgin olive oil.